Good evening, dear readers! I hope this post finds you well and you have had a wonderful week! I am back at home after an exciting and busy trip to Las Vegas for Cosmoprof North America, and I hope to get back into my normal routine as quickly as possible. I hope you have been following me on Instagram and Twitter as I have been sharing little sneak peeks as my signal would allow while I was attending! I have been debating on how I wanted to even start to share my experiences there on my blog as I met with so many phenomenal people and companies at this event. After some consideration, I decided the best place for me to start is with Zoya Nail Polish and Treatments. The Zoya brand is the one that really got me interested in nail polish, and I had the most incredibly mind-blowing experience in their booth. Part of Zoya's display included this beautiful rainbow of nail polishes. I enjoyed perusing through all the bottles, and my Zoya wishlist grew as I stood there. I found myself drawn to some colours I already had in my collection, and I enjoyed shades that I previously had never really considered before. As I was looking, I got to chat briefly with a few of our beloved Zoya faires. It was wonderful finally getting to put a face (or three) to the fairies! They shared with me sneak peeks at upcoming collections, and I cannot express just how excited I am about them! 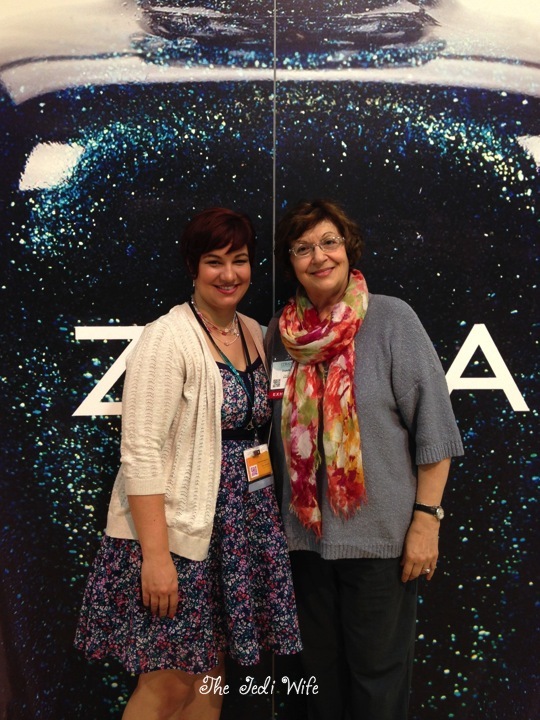 All of the fairies were truly wonderful to converse with, but the highlight of my stop at the Zoya booth was getting to meet with none other than Zoya herself. She is truly a remarkable woman, and I am honored that she was able to set aside some time to speak with me. Born in the former Soviet Union, Zoya Reyzis became a refugee and immigrated to the United States as a classical pianist. Unable to speak English and therefore unable teach students, she earned her full Cosmetology license. Both Zoya and her chemist husband, Michael, decided they needed to create their own line of polish when they realized all the nail polish on the market contained a series of nasty chemicals. Mauve and variations of the shade were ever-so-present at the time, and Zoya desperately wanted to introduce new colours of polish to the world. Zoya had also been inspired by strong women in history and opera: Cleopatra, Carmen, Nephratiti, and she knew she wanted to name her colours after these women. The rest, as the expression goes, is history. I left the Zoya booth feeling enlightened as we discussed music and historical women throughout history in addition to the cosmic activity of the universe. I was also struck by a story that Zoya shared with me in which others she knew that had come to the United States had changed their names to something more western. Zoya had no desire to change her name and refused to do so. The meaning of Zoya in Greek is life, and I could not think of a name more appropriate for such an astounding woman. I can see this strong sense of life and the spirit of Zoya in each beautiful creation, and this has only heightened my love of the brand. It was an honor to speak with her, and it was an experience I will always treasure. This beautifully written post is a great tribute to your experience! Thank you, Liz! It is always harder to write a personal post, and I took a few days deciding how I wanted to write about the experience. Thank you for reading! How exciting! I love the rich history behind it all. Me too! The story is even more powerful when you hear Zoya tell it. This post is so full of win! It is definitely an inspiring story! How exciting, we have nothing like this in the UK and I just love reading about all my favourite bloggers experiences at Comsoprof. I love reading about Zoya's background, I had no idea at all. Zoya is a wonderful storyteller, and it was inspiring to hear her tell it. Hopefully you can come to the US for Cosmoprof next year! As your roomie on this adventure I can honestly say that you were thrilled and enlightened by meeting Zoya and your chat! What a wonderful experience you both shared! How exciting to be able to talk on so many different levels with Zoya herself! I'm so proud of you and happy for you!